HELL YEAH! Cant wait to see him play. Nice way to end the season! I think you may have found a another "Diamond in the Rough" here. SEND THE SCOUTS!!! Send Conroy too! CalgaryFlames.com homepage is now streaming the Hobey Baker live for those that want to watch. Gaudreau looks extremely nervous up there. Poor guy. looks great! JH is ready to go pro! Congratz Johnny Gaudreau!! Johnny-Be-Good Hobey 2014!! Congrats Johnny on the Hobey Baker! In the words of Peter Maher..."YA BABY!!" Best news all day...gotta admit to be nervous, but all is well with the world now. After the final game, are the flames allowed to send him to abbotsford for the playoffs? Then I would imagine they go to the Heat team for the play-offs. Pretty exciting stuff. Its my understanding that none of the 4 college players we have signed are eligible to play for the Heat this year as they were all signed after the trade deadline. Glad he is inked as well as Arnold. Now lets hope everyone allows the kid some room to develop at his speed and not over exaggerated expectations. With him signed is all the more reason you need guys like David Wolf in the Line up and Grats. No different than 99, touch the kid and your getting a beat down. I don't have official word on this, but Hanowski last year did not play any games in the AHL, only 5 NHL games. if they were allowed to send him down for playoffs, i can't imagine why they wouldn't have. 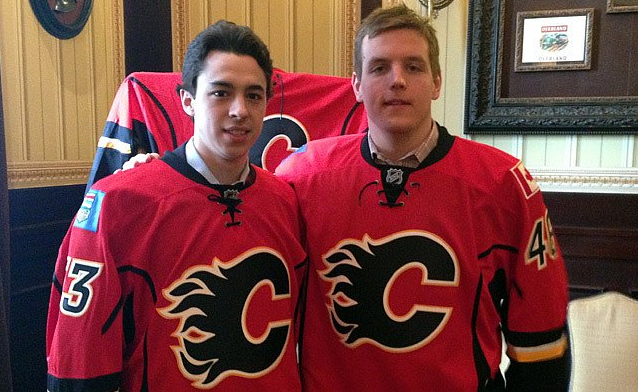 Welcome to Calgary Johnny Hockey and Bill Arnold!! No they cannot. They would have to sign ATO's which is what I think would have been a better move then 1 NHL game if they even play. Pardon my ignorance...but don't they have 2-way contracts? Or does that not apply in this case? if they sign an ATO they get to play in the AHL playoffs, and get the nominal amount that they would get paid (if anything). by doing this they each got 90k +1 games salary +1 year burned on the entry level contract (so more money earlier if he pans out). If your the player, which do you choose? and more importantly, if you don't choose the NHL contract route, why would you sign with the team today, rather then wait until august and get your pick of teams? I agree, from a development perspective if he played the AHL playoffs that is theoretically better (they could lose in 4 straight, etc. ), but there is no advantage for the player going the route. the flames traded a year of the contract in exchange for them signing. both sides win. because of when they signed they cannot be sent down anymore this season. all a two way contract means is the player gets different salaries in the NHL and AHL. it does not protect the player from waivers, or otherwise change the terms of the contract beyond salary for all intensive purposes. Admittedly I was doubtful Gaudreau would sing, but boy do I like being wrong in this case! Really excited to watch Gaudreau develop. After doing some research on this guy I'm just as excited about him too. He has shown a consistent ability to adapt and improve, which is really a huge thing some prospects never really find. while I'm not suggesting a No 1 Ctr here, I really think he has potential to push and become a No 2 Ctr, which if he stays here, is saying a ton with our current crop of solid No 2 Ctrs in the likes of Colbourne, Backs, Grandlund etc. This is a really great problem to have moving forward, and I i'm close to being right, could allow Heartly to roll 3 and possibly even 4 lines all the time, which many of the really good teams like Bos, Chi, Stl often do. The key, is having that Ctr depth where your 3rd or 4th line Ctr can easily step in and fill the No 2 slot. I get the feeling Arnold give the Flames this opportunity. Time; however, will tell, but there is a real possibility for it to happen! Hello from the Flyers boards! I'm only here to participate in this thread because Gaudreau grew up in the town bordering mine (I lived in Pennsville, NJ. Carney's Point is a 5-minute drive), so I hear a lot about him. I was reading through the thread and I was surprised to see how many voted that he'd be a star. I'm not here to be a debbie downer, by any means, but do you guys really see his game translating to the NHL at a mere 5'7? That's where I think he's screwed. My buddy pointed out the potential Briere scenario, but even Danny had 3 inches on him. That makes a difference. I wish the best for him, I have friends who hangout with his sister and such and they're a nice family (from what I've seen). I just am doubtful it'll workout at that size. I know you Flames fans need some hope, so I don't blame you for getting hyped for a good prospect (I'm right there with you with Gotisbehere). Just curious to hear people's thoughts because I haven't seen his height discussed much.